System 1738® is a system fully certified to UL 1738; consisting of pipe, fittings, termination kits, and cement manufactured to strict quality, performance and dimensional standards. Historically, the plumbing and HVAC industry has not nationally regulated the use of plumbing pipes and accessories used for thermoplastic Flue Gas Venting (FGV) installations. Currently, the use of plumbing Schedule 40 Solid Wall or Foam Core Drain, Waste, and Vent (DWV) pipe and fittings are allowed if they are referenced as options in the appliance installation instructions. Schedule 40 Solid Wall or Foam Core plumbing DWV pipe and fittings do NOT meet the UL 1738 safety standard for venting one of the most dangerous and silent killers: carbon monoxide. The use of plastic venting systems on gas fired water heaters, furnaces and boilers has undergone a significant change. NFPA 54-18 (National Fire Protection Association) National Fuel Gas Code and IFGC-18 (International Fuel Gas Code) now recognizes the UL 1738 venting standard as an option for venting Categories II and IV gas fired appliances. The change to both these model codes empowers relevant authorities to allow the use of a vent material specified by the appliance manufacturers or to be certified to the UL 1738 venting standard. System 1738 Flue Gas Venting offers a full range of pipe, fittings and termination components that are manufactured from an engineered PVC compound, rated for a maximum flue gas temperature of 149˚F and that are fully certified to the rigorous requirements of UL 1738 venting standard for gas-burning appliances, Categories II and IV. 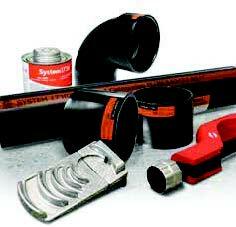 System 1738 pipes and fittings are black in color which protects against UV degradation. Material type, application and temperature rating is included in the pipe print line as well as on the orange and black labels applied to each fitting. All System 1738 products have been certified by Intertek and carry an ETL mark as proof of certification. Markings on pipe and fittings are required by UL 1738 and clearly distinguish a certified gas venting system from every day, non-certified plumbing pipe and fittings. Look for the System 1738 label and the mark of a recognized certification agency as assurance that the venting system being used is certified.